brian and i headed down south over memorial day weekend to memorialize our 8th anniversary and to just get away for awhile. we decided to go to escalante national monument after brian heard a colleague mention going there. it was difficult to find out information about the monument online--so when we drove down there on friday we weren't really sure what we were getting ourselves into. we got to go through areas of the state we've never seen before, which was fun. driving through dixie national forest was interesting. the landscape was beautiful with lots of pines and really tall aspens. but it was also very, very high up. so climbing the mountain, we sometimes found ourselves going as fast as 25 mph. but, if you can imagine we did still manage to pass some motor homes at that speed. this is a view from the top of the dixie national forest. we made it to escalante friday evening and headed out onto a clay dirt/gravel road. our goal was to go several miles in and then camp off the side of the road and then get up on saturday and drive the rest of the way to some cool slot canyons and hikes. we made it 20 miles out onto this road and decided to stop so we could set up our tent, eat, ect before dark. we did all of that and enjoyed feeling like we were out in the middle of nowhere (no one or human-made thing was visible from where we were). our only company was a jack rabbit and cows. cows just seem to be all over escalante, and if you don't see them you know that they have been around because there are just tons and tons of cow pies. i've never seen so much cow poop. but a lot of it was old, so we just kicked some out of the way to set down our tent. that night we settled into our tent and did some reading up on the monument. then, probably around 9:30 it started to rain. and it proceeded to rain all night long. there were a few times when we thought it was going to stop, but then it just started up again. neither one of us slept well (we couldn't remember falling asleep at all), but thankfully for us we didn't feel too wet. in the morning we discovered there was a puddle at the foot of the tent and that our pillows, sleeping bags, blankets, ect were really very wet. all of that wouldn't have been too bad except we had driven out 20 miles on a mostly clay dirt road that, when wet, is extremely difficult (sometimes impossible) to drive on in a 2-wheel drive car like ours. so we carried all of our wet stuff quickly to the car (trying to avoid stepping on cactuses and cow pies) and threw it in the car. we both had visions of being stuck out there and/or having to pay for a tow truck. but, somehow, we made it out. every time we drove through a big puddle or went up a hill we were really worried, but we made it back the full 20 miles. honestly that seemed like a miracle. we made it into town around 8:15 and went to the gas station to find out what we could do on a wet, rainy day when going anywhere that required 4-wheel drive was out the question. while we were there, i noticed a sign advertising a sons of the utah pioneers memorial day breakfast at the local park at 8:30 am. it just happened to be 8:30 am so b and i went over to the park and ate an eggs, ham, pancake, and hot chocolate breakfast with a bunch of escalante locals. while we were there, we ended up eating with one of the town's most prominent citizens and a former berkley paleontologist. the berkley guy told us about how he bought this crazy house that had originally been a pioneer home and grainery that was then subsumed in a updated, expanded home that comprised the original home and grainery and the "new" sections of the home. he took us on a tour of the house, which was indeed crazy. some of the rooms were half finished, had doors that didn't fit, had dirt floors, had slanted ceilings, had huge, old stoves that didn't work, or showers that weren't hooked up to a waterline, and bathrooms that were meant to be walked through to reach another room. it was wild, and there was so much junk it. but a lot of cool old furniture and stuff. eventually he wants to turn it into a museum. we wished him luck on that project. it turned out that we were in escalante during it's heritage festival so we went to the high school to attend a presentation on escalante architecture (there's lots of neat old homes, barns, ect there). and they were also selling arts and crafts there. brian even got to help set up chairs. while we were there, an extremely nice couple found out that we were in a bad way (since our tent was soaking wet and none of the hotels had vacancies) and offered to let us spend the night at their house. they were an older couple and were so generous. it seemed like something that would happen in a different time. but escalante just seemed like the sort of place in which something like that would still happen. it cleared up that afternoon, so brian and i went to the petrified forest state park. a view from a high up ledge. it gave me a bit of vertigo being close to that edge. a nice piece of petrified wood. that's my hand. it's supposed to look like i'm getting a splinter. after we looked around the petrified forest we went birding. we saw some super cool birds including, but not limied to the black headed grosbeak (a new one for us), the yellow breated chat (another new one for us), the bullock's oriole, and the western tanager. that night we went to the escalante heritage festival community play. it was written by a man in escalante and told the history (or part of it) of the town and some of its humorous episodes. it had always been a dream of brian's that he would just wind up in a small town and happen upon a community theater production. and boy did brian's dreams come true. now it's his dream that he'll come to a small town and happen upon a community theater production and not fall asleep during it. saturday night we stayed at the very, very kind couple's home. and it was such a luxurious sleep after not getting any sleep the night before. the next morning we got up and went to church and said good bye to our new-found escalante friends. during the rest of the day, we did some more exploring and hiking around the monument. we saw some new birds, walked around in some amazing places, met some interesting people, and got rained on some more. the pictures below show some of the highlights. this shows the sky when the storm clouds were brewing. it rained every day we were there. apparently it hardly ever rains there in may like this. the locals were really glad to have the rain--so it made it seem ok that we couldn't make it out to the slot canyons we had wanted to hike through. this was a view as we were nearing canyonlands national park. the piles of clay/sand were amazing. i couldn't believe the colors. some of it even looks purple. this is me on top of a sand rock peak we climbed up. you could see a valley on either side of the top. this is me in a small slot canyon we saw. brian was so happy when we made it just barely into capitol reef national park. it turns out that the paved road that took us to the park turned into an unpaved road as soon as you hit the park. we had thought we might drive back home through capitol reef until we saw that it was unpaved. this is b in a slot canyon that we just happened upon on our own while we were out hiking around. sunday night we decided we'd sleep in the car. our tent was still wet, the hotels were still full, and it seemed like too much to stay with that nice couple for a second night. so we ate our canned chili in the car and then tried to stretch out as best as possible in the front two seats of our geo prizm. as you can probably imagine it was another long night. we didn't sleep well again, but at least we weren't wet, and it was nice to "wake up" in the morning to see the sun coming up over the rock mountains. monday morning we went on a hike to a waterfall. the hike was so delightful. the scenery was beautiful (it was in a red rock canyon along a creek) and we even saw some old fremont people graineries and pictoraphs (they're over 800 years old). we saw some new birds again, and the waterfall area was refreshing and picturesque. below are some pictures of the hike. the blossoming cactus pictures. i loved all the varieties. the pictographs--see the three people holding hands. as soon as we finished the hike it started raining again. so, fittingly, we left escalante in the rain. driving through the mountains in the dixie national forest we ran into some snow and hail, but it soon cleared up and it was sunny the rest of the way home. brian and i celebrated our 8th anniversary last sunday. after church we went over to hobble creek canyon to do some exploring and went on the most amazing hike. we walked along the creek as it came down the canyon. the water was cool (literally) with lots of rushing and little waterfalls. and, if you can imagine, we saw three new birds. we're experienced enough birders that it's not very often that we see so many new birds on a single outing. 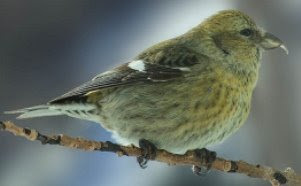 below are some pictures of the birds we saw--our favorite was the white-winged crossbill. 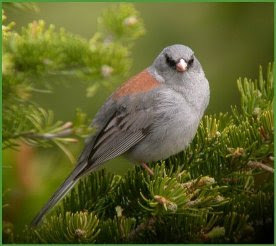 this gray headed junco is a bit more puffed up and mean looking than the one we saw, but you get the idea. just check out that crossed bill. whilst we were in the canyon we also found a yellow-bellied racer (also known as the mormon racer). the poor snake was dead, but it was still a good sighting. thankfully we had gone to the library the day before and checked out a handy book called "snakes of utah" so we could accurately identify it. we also saw several little chipmunks. when we came back home we enjoyed a nice dinner together and then had fresh cut mango and tembleque for dessert--mango and coconut are a winning combination. we also sat out on our back/side yard swing. it was one of the first truly pleasant nights we've had so far. and there will be so many more to come this summer. it was such a nice day. thank goodness brian and i both went to see a three punk band show at rick's college back on a nice september evening in 1999.
below are some pictures of mother's day weekend and my birthday. me and the feijoa i tried over the weekend. it's a new fruit for us. it had an interesting and unique flavor and texture. mom with her mother's day cards. me and b at the river. we walked along the river up the canyon and saw some birds and felt some cold, cold water. brian with the gopher snake we found on the trail. this was brian's first sighting of a gopher snake--and mine too. brian all wet from the water flowing behind him. he really enjoyed feeling the power of the water as it was flowing down the dam-like thing. me and mom with all the birthday mole! me with my birthday red hair that i thought looked good with one of my favorite dresses. then, of course, i had to put on my new glasses (i think of them fondly as my elton john glasses). so today is my 28th birthday, but first i'll start with the ketchup. we had a fine weekend filled with good finds at the thrift store, picking of redbud blossoms (yes, they are edible. and yes they do grow here in utah. ), hanging out with family (which included grilled salmon! ), celebrating mother's day with my mom, dying my newly shorn hair red, and finding mushrooms in our yard (yes, those are edible too). we also got to celebrate from a distance david's phd graduation. yea, david! so back to today. i love celebrating birthdays and am a firm believer that they don't need to be confined to just one day. in fact, may is really kind of a big celebratory month since it's my birthday and our anniversary. so far, to celebrate today i've worked a 1/2 day (instead of a full day) and went on a long run. when brian comes home soon we're going to go up into the canyon to walk along the provo river. 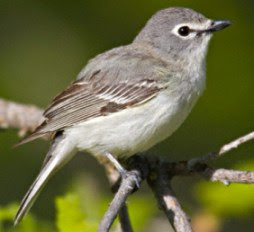 the goal will be to be outside and enjoy the beautiful sunny weather and see birds. it will be easy to enjoy the weather...but i just hope beyond hope we'll see some birds. then tonight we're going out for mexican food with my mom. there's a place in slc that's supposed to have good mole. so i'm willing to go and judge whether or not it is good! so turning 28 (and maybe because my hs reunion is this summer) makes me think of what was going on 10 years ago when i turned 18. without going back and looking at a journal, here is what i remember. mom made me strawberry/whip cream waffles for breakfast. i didn't have to go to school until like 10am or so since i no longer had to attend calculus class (i wasn't taking the ap exam). for some reason i felt kind of bad that morning, but it turned out i wasn't sick. during lunch i ate in the hallway with my friends and they gave me presents. that evening there was a home track meet. i ran the 1500 and probably the 4x400 relay. i don't remember anything about the relay, but the 1500 was the fastest i ever ran that length. i ran a 5:14, which i was proud of. there's a pretty scary picture of me to commemorate how "good" i felt after finishing the race. that night for dinner we grilled chicken and steak, had homemade rolls, potatoes, jello, corn on the cob, and kool-aid. of course, all of that was my choice (obviously there did need to be two types of meat). then we had cake and ice cream. i don't remember how warm it was (probably not very warm), but i do remember it wasn't raining. and that was always a birthday miracle living on the oregon coast. so that unclear picture is me, my dad, and my brother kyle enjoying my very meaty 18th birthday dinner.